At PAX Prime back in September of 2013, Keiji Inafune was centered in the public eye with the announcement of Mighty No. 9. At the convention he conducted multiple interviews with online gaming news outlets, with questions polled from fans on various subjects. 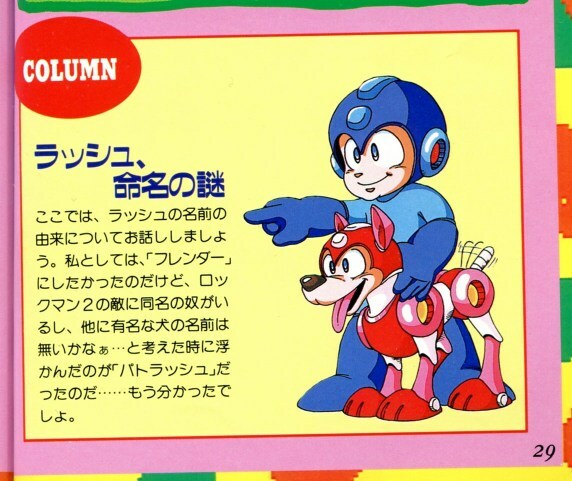 One topic that was mentioned in multiple interviews was whether Mega Man’s dog Rush was named after Rush the band whose popularity blew up in the early eighties with hits like “Tom Sawyer“, “Limelight“, “Freewill” and “The Spirit of Radio“. Was all this modern music making Mega Man machinery? Nope. In interviews with both Mega Man Network and Destructoid, Inafune insisted that “Rush” in this case was not a musical reference, but rather inspired by Rush & Crash, a.k.a. The Speed Rumbler, a Mad Max inspired arcade game released by Capcom in 1986. Fans with the Mega Man Official Complete Works book may recall that Crash (a.k.a. Crush) was also a name idea for Rush’s rival wolfhound character that eventually became known as Treble/Gospel. If that weren’t enough, in the Destructoid interview Inafune also cited the iconic collie dog Lassie as a possible influence (compare in Japanese, Rush ラッシュ “RASSHU” to Lassie ラッシー “RASSHII”). So there we have not one, but two plausible influences. Case closed? Well, maybe not. Rockman Character Collection, bottom of page 29. Here, we’ll discuss the origin behind the name Rush. Personally, I wanted to name him “Friender”, but there was already an enemy in Rockman 2 with that name. I thought to myself, there must be some other famous name for a dog… That’s when I remembered “Patrasche” and inspiration struck! …Maybe you figured that out already. Friender was the robo-dog of Tatsunoko’s cyborg hero Casshern, the most direct inspiration on Rush’s character and his vehicle transformations. A mini-boss also inspired by and named after Friender can be found in Wood Man’s stage in MM2. Patrasche is the loyal pet of Nello in the tragic story A Dog of Flanders, which was adapted into a popular anime TV series and OVA in the seventies. The way Patrasche is written in Japanese, you can basically drop the “Pat” and you are left with “Rush” (again, compare Patrasche パトラッシュ “PATORASSHU” and Rush ラッシュ”RASSHU”). So was Inafune wrong about the name’s influence then? I don’t think so. Clearly there can be more than one influence (Inafune threw out two himself). And while we don’t know who wrote this column as none of the Rockman Character Collection authors are listed (in those days game developers weren’t allowed to be credited under their own names), it makes sense that different developers working on the game may have had differing reasons for favoring the name Rush for the dog. Each of these can be considered equally valid. For all we know, the Capcom USA localizer responsible for keeping the name “Rush” in English (instead of “Rash” or even just making up some other name) could have been a fan of the band. When it comes to the question of “Why Rush?” the answer can still be open hearted, not so coldly charted. It’s really just a question of your honesty. Yeah, your honesty. 6 Comments to "Robotic Utility Support Hound"
Actually, is funny how many Mega Man characters are inspired in Neo-Human Casshern. There’s just no end to the mystery of Rush. I remember a time when there were no answers… now there’s too many! Also, amazing way to end this post, lol. Heh, “Crush” was the name I came up with for the canine sidekick for my evil Mega Man doppelganger, “Nega Man”… waaaaaay back when I was a boy. Inspired at all by Darkwing’s nemesis Negaduck? Because I had the same thought. 🙂 My Nega Man was red like the MM7 battle mode/MvC alt. What color was yours? Yep! I came up with it after that very episode, Negaduck, where Darkwing was split in two. Nega Man was black and grey, as was Crush. I should add, not THE Negaduck, but the other one.